This was my 30th birthday. 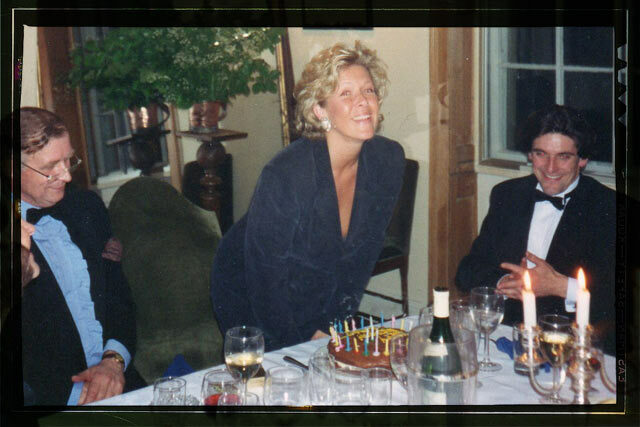 It was a dinner party organised by my lovely Daddy, who is on the left of the photograph. Check out the big hair!! (mine, not my Dad's, I'd caused him to lose most of his). As the eldest member of staff at Donna Ida I cringe to say that this was 1993!!! I LOVED my grey silk trouser suit, bought for my party, and earrings which could surely have enabled me to get satellite without subscibing to anything!! All of my closest friends were there, which meant such a lot to me. It was at our hotel in Lancashire, where I grew up. It must have been a weeknight as my Dad would never have shut the dining room at a weekend!!! !